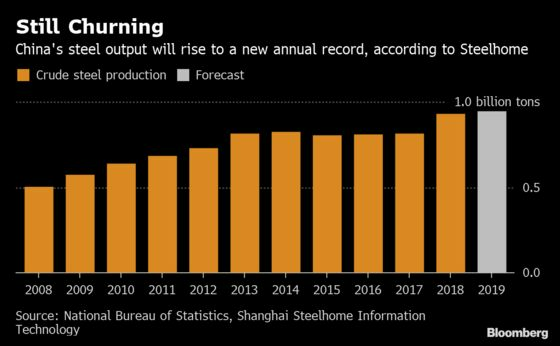 (Bloomberg) -- China’s steel industry notched another production record in the first quarter, spurred by consumption in the infrastructure sector as government stimulus props up demand. The maker of half the world’s steel churned out 231 million tons between January and March, up almost 10 percent from a year earlier and the highest for any first quarter on record. Production in March climbed 10 percent to 80.3 million tons, according to data from the statistics bureau. Output is rebounding with steel prices as China’s economy holds up, with pro-growth policies helping arrest a slowdown that had weighed on materials demand since the middle of 2018. Spot prices for rebar climbed this week to their highest since November, boosting producer margins and spurring higher output. China’s economy grew at 6.4 percent in the first quarter, beating estimates and fueling the debate over whether the economy needs further stimulus measures. The demand environment for metals is improving, Citigroup Inc. said earlier this week, with gauges such as new credit and manufacturing activity signaling a “bullish turn” in Chinese growth sentiment and activity. There are caveats on the steel numbers. Kallanish notes that steel purchasing is peaking earlier than normal, and is probably lower than last year, due to an earlier Spring Festival. The country’s steel use will expand 1 percent over 2019, compared with an earlier estimate of flat growth, before declining next year, the World Steel Association said in its twice-yearly outlook on Tuesday. Busier activity at China’s steel mills coincides with serious disruptions in supply of iron ore that’s sent benchmark spot prices surging more than 30 percent this year. While Vale SA said a major shuttered mine is set to reopen imminently, the miner didn’t change its lowered sales guidance for 2019. Rivals BHP Group and Rio Tinto Group have also trimmed annual production guidance after bad weather and operational issues. The iron ore market was already tightening before Vale’s disaster as seaborne supply contracts and steel output continues to expand, Siddarth Aggarwal, Anglo American Plc’s research manager for steel and iron ore, said in an April 13 presentation in Shanghai. He said the trend for higher output would continue this year. China’s steel production will rise 1.8 percent this year to a record, with rising prices extending into the third quarter on better demand, according to Shanghai Steelhome Information Technology.